Do you have a boy baby shower coming up? 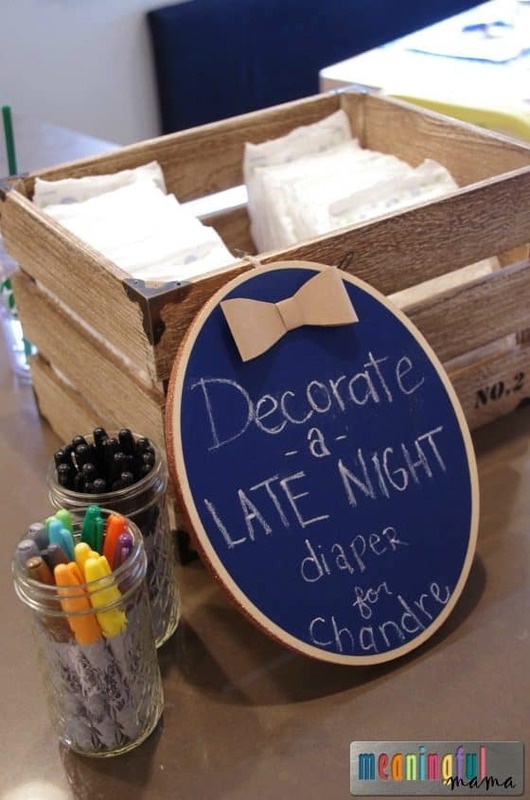 Perhaps these bow tie boy baby shower ideas will help inspire your next party. We had a lot of fun celebrating a dear friend with these theme. 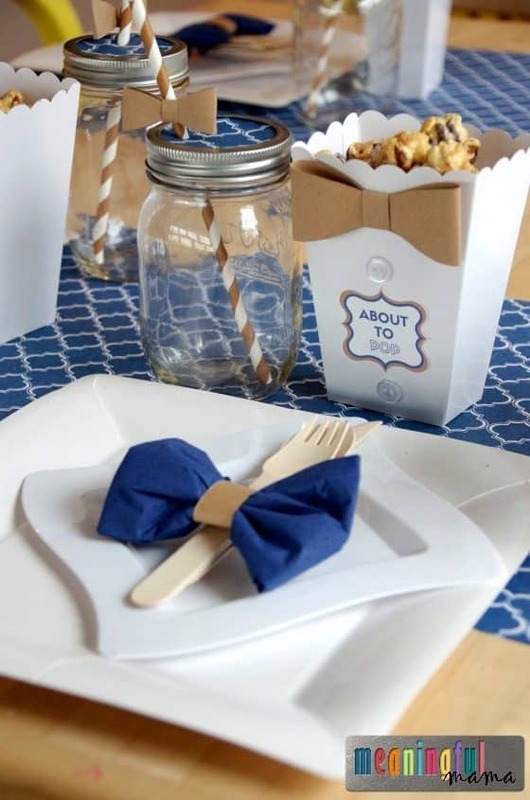 I’ve shown you how to make the “About to Pop” popcorn boxes, the boy baby shower cake and the bow tie napkins. Today I want to present the rest of the components that brought the shower together. I help with a marriage ministry at our church and have lead a small group for the last 24 weeks of couples dedicated to working on their marriage. We have become a close group. 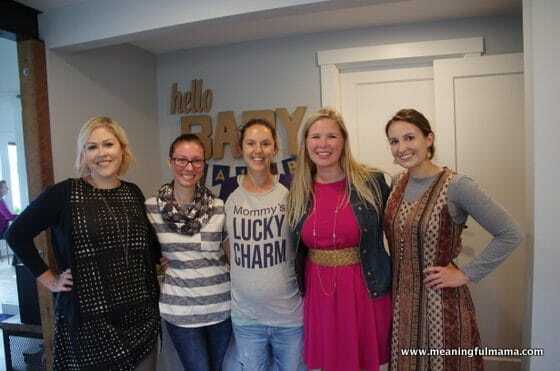 This shower we worked on together to celebrate one of the pregnant ladies in our group. The bow tie theme wasn’t really incorporated into the food table backdrop. I found these cute “BABY” letters and cursive “hello” at JoAnn’s Fabric and fell in love with them. The cardboard letters can be found on Amazon. It looks like there are some wood cursive hello signs on Etsy. I also cut out letters of the baby’s name on the brown paper bag colored stock paper . We glued these to blue burlap hanging bunting . I found these exact ones at Michael’s craft store but I linked to paper ones on Amazon. I hung the burlap banner on twine . Regret: I was in a hurry and hadn’t put the cake out yet. I was trying to clear it by hanging the banner higher, but it was too high. I wish I had hung it a bit lower. 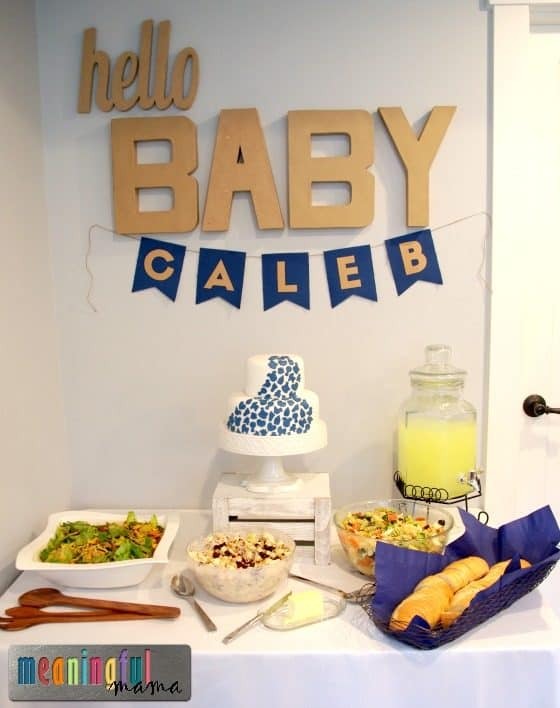 This was a salad shower, so we served a variety of salads, bread, lemonade and cake. 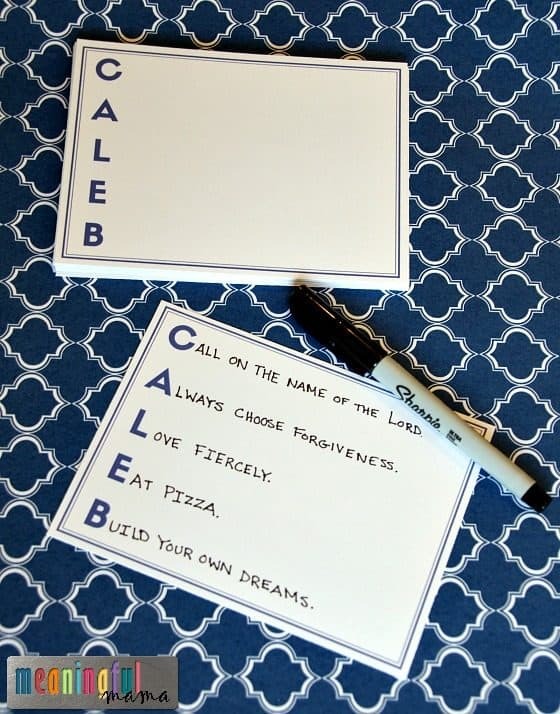 One of the baby shower mementos we decided to do was an acronym for the babies name. We had people fill out their own wishes or advice for the baby on cards that the mother-to-be could keep. 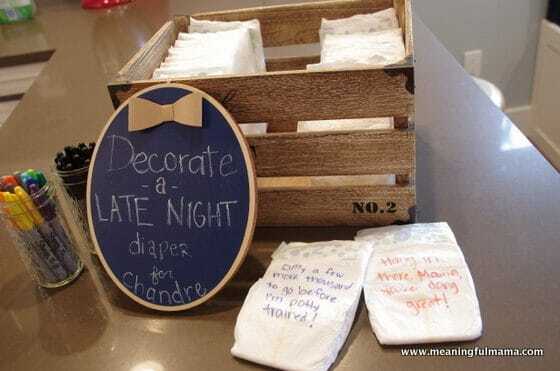 Another baby shower memento idea is to have people write messages on diapers for the middle of the night diaper changes. These are words of encouragement for the new mom. 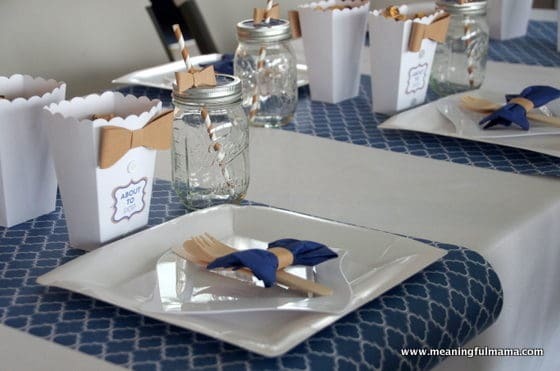 As already seen on Meaningful Mama, the table setting consisted of the bow tie napkins and wood silverware. Links to all the tableware products including the napkins, silverware and plates can be found in the post I linked to in this paragraph. I also set the table with the “About to Pop” popcorn containers. The mason jars had a decorative top using the blue lattice paper I got from Michael’s (linking to something similar on Amazon, but I like the size and format of Michael’s – perfect for a table runner). 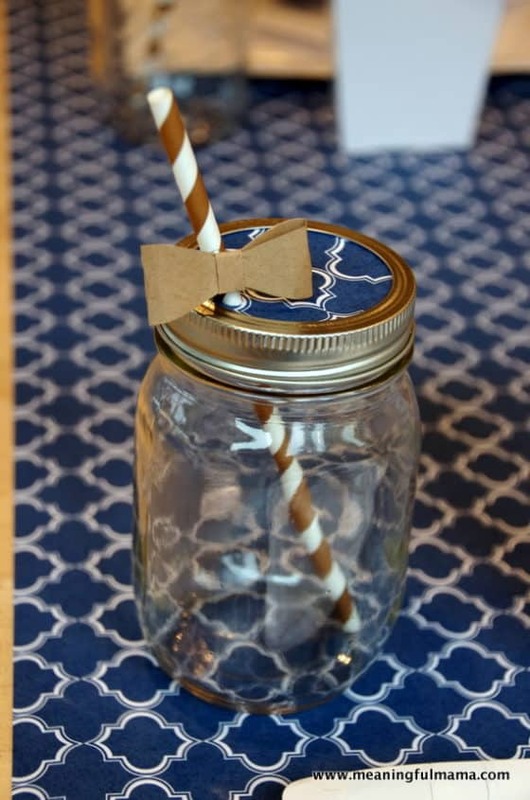 See how to make cute tops for your mason jars here. I also got brown striped paper straws . We made mini bow ties on craft paper using this template. Simply go to your print setting and print two per page for the smaller sized bow ties. You can scale it to any size in print settings. There you have my collection of Bow Tie Boy Baby Shower Ideas. I hope this helps as you celebrate new life with your friends and family.